My husband is the ‘man meet grill’ kinda guy. Rain or shine, he is ready to jump outside and char us some meat. Since we (ahem) tend to find ourselves living in remote, frozen locations because of our (ahem) jobs, it is a good thing he isn’t thermally challenged. 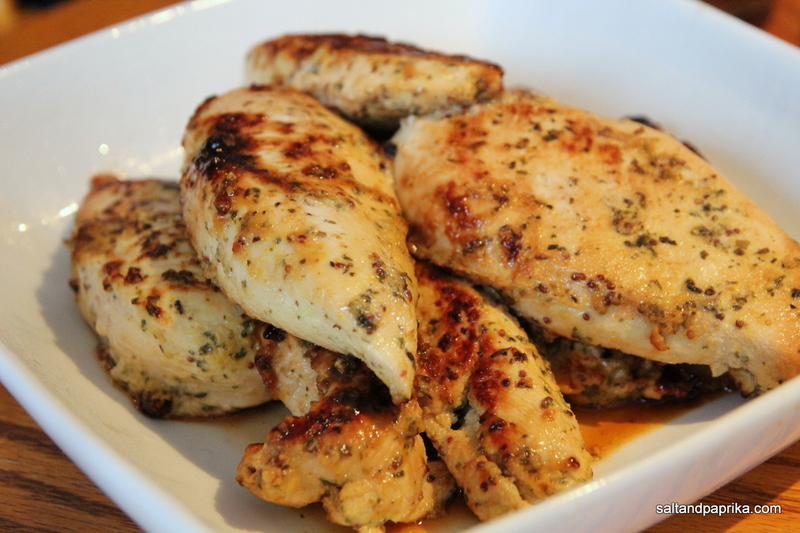 This chicken recipe is a must every time we shovel the snow of the grill. Forget any dry chicken you had before, this one is almost impossible to miss. Juicy, tender and flavorful, I’ve been eating this chicken for almost 15 years now and never get tired of it. My kids eat it cold straight from the fridge and sliced thin, the leftovers make amazing sandwiches. You gotta try this chicken, I promise it works even if your ears aren’t frozen crisp. In a large container, mix the honey, oil, mustard and the rest of the marinade ingredients to a creamy consistency. Add chicken breasts to the marinade and put in the fridge for at least an hour. Overnight is best. Grill on medium high heat, about 8 minutes each side, or until the chicken is just short of being pink inside. Not sure? Cut one open and check. You want the breasts juicy, and not white and dry.